The year was 1903. It was a freezing cold December day. The Wright brothers were on a beach just outside of Kitty Hawk, North Carolina, their Flyer ready to take to the air. They had attempted flight before (and succeeded), but this time would be different. The Flyer was now equipped with an engine. This would be their second attempt at powered flight. Orville Wright was on his stomach at the controls. 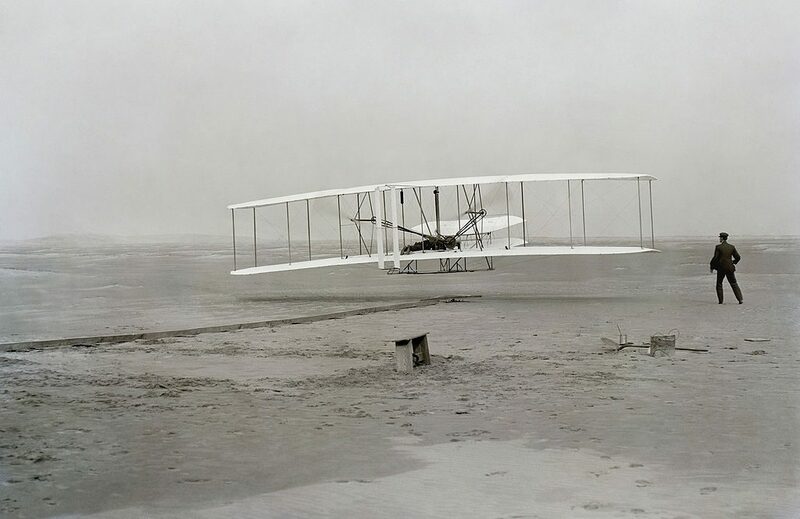 Wilbur Wright was to the right of the machine, helping to balance the Flyer as it took off. At 10:35am, the Flyer roared off the ground. 12 seconds (and 120 feet) later, the flight was over. But it didn’t matter. December 17, 1903 marked the first controlled, sustained flight of a powered, heavier-than-air airplane. Orville and Wilbur Wright would go on to become two of the most famous inventors in history. Their invention gave birth to the multi-billion dollar air industry we know today. The brothers achieved this remarkable milestone on a tiny budget – using the profits from their bicycle shop, Wright Cycle Company, to finance their aviation experiments. If they didn’t spend long hours repairing and selling bicycles, they wouldn’t have had any funding for such a venture. Other aspiring aviators – there were many at the time – had better funding than the Wright brothers. Samuel Langley was the most well-known. As head of the Smithsonian Institution, he had everything he needed at his disposal including over $70,000 in funding. Langley still failed to create a manned machine that could fly. What separated the brothers from other aviation experts was their intellectual curiosity. Intellectual curiosity is the desire to know more. Not just random knowledge, but focused on a specific task, idea, or problem. 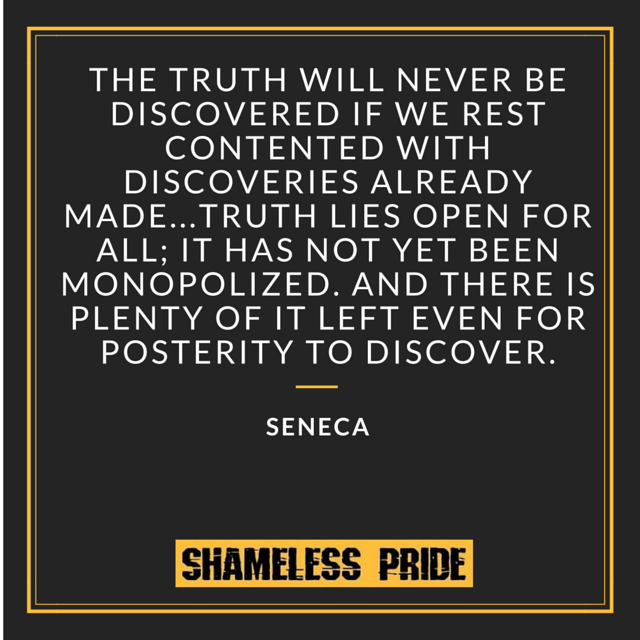 Such deep research leads to a greater degree of understanding, which can spark an obsession to know more or question the facts. You look at a problem from a fresh perspective. 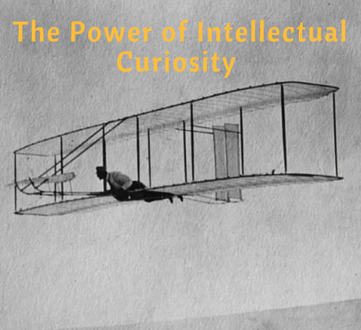 In the book, The Wright Brothers, we discover that such curiosity began in their youth. They grew up in the working class city of Dayton, Ohio. Their father was a preacher who championed hard work and encouraged them to always question the status quo. Bishop Wright taught his children the virtues of manliness, as well as how to form independent thought. They were encouraged to take risks, to try and fail, and to spend their time on what they enjoyed. As with almost all success stories, books played an important part in fostering a curious sense of wonder for the Wright brothers. The obsession began in May of 1899, when Wilbur Wright wrote to the Smithsonian Institute requesting any materials on aviation and the pursuit of manned flight. The brothers devoured these readings and became to formulate their own theories and ideas on attempting flight themselves. They brainstormed unorthodox methods and – for the time – radical ideas to deduce a working theory on what was necessary to achieve flight. They cared little for outside opinion, and used trial and error to worked through any obstacle they faced. They even spent hours studying the flight patterns of countless birds, which helped them immensely. The Wright brothers achieved flight because of their ability to see the big picture. They embraced bold thought. Fueled by their work ethic and calm under pressure. they became obsessed, and their intellectual curiosity carried them through all the adversity they met. Their resolve was incredible. Every setback was met with calm determination. No mistake or accident could deter them in their quest for flight. It wasn’t long until their own experimentation debunked much of the science and ideas they had read about just a few years before. Remarkably, less than four years after Wilbur’s initial inquiry, they would achieved powered, manned flight. The Wright brothers had no special advantages in life. They did not finish high school. They had no experience with machinery, and were self-taught in everything they did. They rarely worked with others, preferring to work as a pair, or alone. They never took money from people or government. They worked 12 hour days repairing and selling bicycles to fund their experiments. What enabled their discovery was their intellectual curiosity, dedication, and ability to see a problem from a unique viewpoint. Their father’s impact on their success cannot be understated. His paternal guidance, an overlooked catalyst for success, never left the Wright brothers. There is much to be learned from the Wright’s achievements. Below you will find FOUR ways to enhance your intellectual curiosity. Each point also includes action items. Conformity is bad. Stop relying on what you think is true. Do some research for yourself. Determine why everyone thinks a certain way, and if this is truly the right way. We are conditioned to accept things the way they are, but it is the person that goes against the tide that makes the biggest wave. Why is this done a certain way? 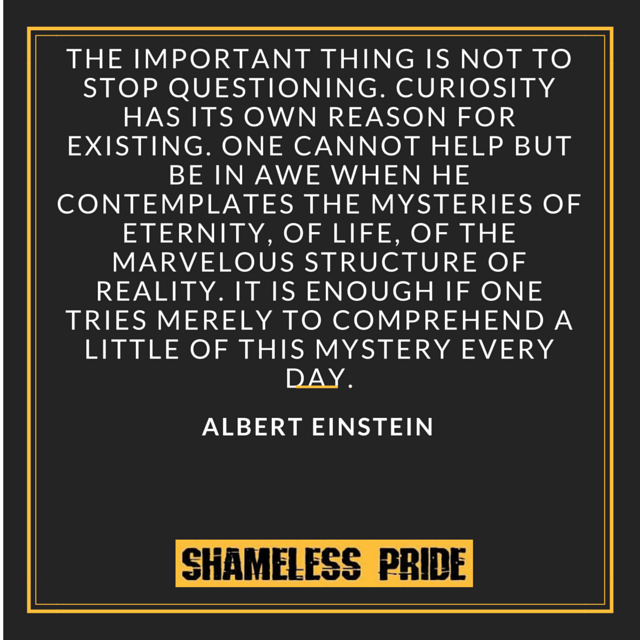 Ask yourself thought-provoking questions and use the vast resources around you to discover alternate theories and ideas. 1) Spend 30 minutes researching the history of a topic that interests you. Drill down deep, with the goal of a more comprehensive understanding. 2) Once a week, do something outside of your normal routine. This could be as simple as a different way to work, a new coffee shop, a different meal, etc. Embrace deep conversations with non-close friends. Instead of the same boring, canned conversations about the weather, spend some time asking deeper questions. Most people yearn for real conversations, not just filler. 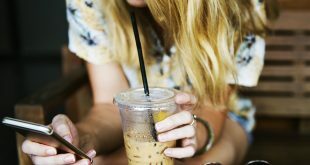 Electronic communication such as text and email leaves an empty feeling aside, as it’s devoid of human contact. Asking someone thought provoking questions makes them feel better, but also makes them realize there is more to you than a blank face and boring personality. Your also likely to grow, as you’ll learn something you didn’t know before (or see it from another perspective). 1) Once a week, engage in a thought-provoking conversation with someone you wouldn’t normally speak with. 2) Next time someone does a favor for you, hand-write them a thank you note. It’s great to show curiosity, but only if it’s focused on something relatively meaningful. Spending all day researching trivial matters will get you nowhere. Focus on things that are important to you, things you want to understand in more detail. Gain a deep understand of a topic and ask how you can apply it to your own life. Knowing the world today, is there chance for growth or greater implementation? Such thoughts can indirectly lead you down a path towards money-making. 1) Think of five ideas that mean something to you, and ask questions about how you could improve upon them using your own thoughts and insights. 2) Can any of these ideas be adapted to make money? To expand your mind, you need to expand your experiences. This applies equally to both real world and what you read. Learning about something new could take you down a different path that could open new opportunities. If you always read self-improvement books, try reading poetry. If you enjoy war stories, try reading about the Oregon trail. If you enjoy science fiction, try a book on the inventions of the 1800’s. Challenging yourself with difficult books helps to increase comprehension skills and the ability to understand more complex issues and arguments. 1) Every third book you read, pick something you know nothing about. Check the ratings first though, so you don’t waste your time on a poor quality book. On the surface, it seems as the Wright brothers success was an anomaly, an improbable situation that defied logic. However, if you investigate further, you are able to see why it happened. From a young age, they were groomed for massive achievement. Their father did a superb job of teaching them the characteristics of success – creative thought, critical thinking, and comfort with risk. They quickly learned that it was okay to be wrong. Questioning how things had been done was a staple of their thought process. Although life was quite different 100+ years ago, most of these same characteristics can be cultivated quite easy today. Ask questions of others to gain a deeper understanding of how people think. You’ll not only be viewed as outgoing and caring, but you will gradually internalize other perspectives into your own. Focus on game changers and don’t waste time investigating worthless ideas. Avoid information overload and direct your efforts to something with substance and earning potential. Vary what you read, incorporating new books on topics you know nothing about. This will help to make you more creative and think in different ways. Utilize the action items above to expand your intellectual curiosity. It’s a crucial part of the success matrix. If nothing else, interesting ideas make life more interesting. As usual, leave any comments or questions below! !